Robert March Hanes, 1890-1959. Robert March Hanes papers (#4534). Selected letters, 1917-1918. 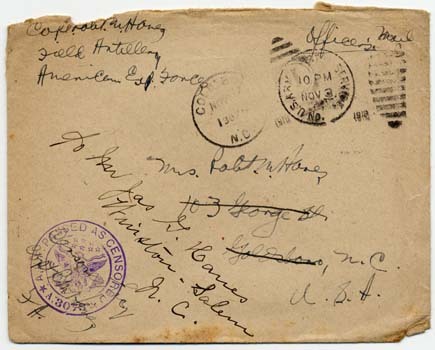 Collections >> North Carolinians and the Great War, The North Carolina Experience >> Document Menu >>  - Envelope postmarked November 3, 1918. Robert March Hanes papers (#4534). Selected letters, 1917-1918. Envelope postmarked November 3, 1918.